This article submitted by Linda Stelling on 6/16/98. Children attending vacation Bible school at St. Louis Catholic Church learned about Biblical times last week. 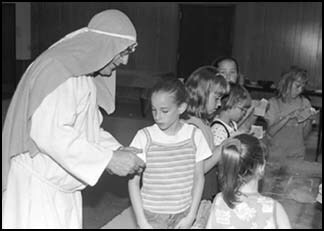 The theme for Bible school was “Journeys with Jesus.” Forty-six children in kindergarten through fifth grade participated. The church was divided into different countries. In Jerusalem, they learned about the market places; Nazareth, carpenter’s shop; Bethany, making stew and bread; Bethlehem, carding wool and in Capernaum, making scrolls. Planning and organizing the Bible school as a Girl Scout “gold award” project were Molly Meagher, Jennifer Wendlandt, Sara Lahr, and Kristen Freilinger.